The soldier with the water proofed pack, which is most likely carrying communications gear, may be Corporal Robert L. Lehmkuhl. See the second video clip below, including screenshot with additional reasoning, for what appears to be “Lehmkuhl” written on the bill of the soldier’s cap which is under his helmet. There are several indicators that the soldier in this video is, in all likelihood, Corporal Robert L. Lehmkuhl. UPDATE (10/27/2015): Received confirmation from Robert’s grandson, Rob Lehmkuhl, who consulted with is grandmother and father, that this is his grandfather. 1) The video description, “LCM (Landing Craft Mechanized) loaded with Marines of the 5th Marine Division underway towards the beach”, indicates that this is footage of the 5th Marine Division AND Corporal Robert L. Lehmkuhl was part of the 5th Marines – HQ Company, 1st Battalion, 28th Regiment, 5th Marine Division. 2) According to The Spearhead (page 265), there is only one soldier in the 5th Marine Division that has the last name “Lehmkuhl” – Corporal Robert L. Lehmkuhl. 3) Robert L. Lehmkuhl was with the Headquarters (HQ) Company of 1/28, 5th Marines Division. The soldier in the footage is carrying a communications device in his pack which would be correct for a member of the HQ Company. 4) The 1st battalion of the 28th Marines (1/28) was the first battalion of the 28th Marines to go ashore in Iwo Jima. The time in the footage is 0930 which would be correct for the 1st wave of the 28th Regiment, 5th Marines to start heading for Iwo Jima. 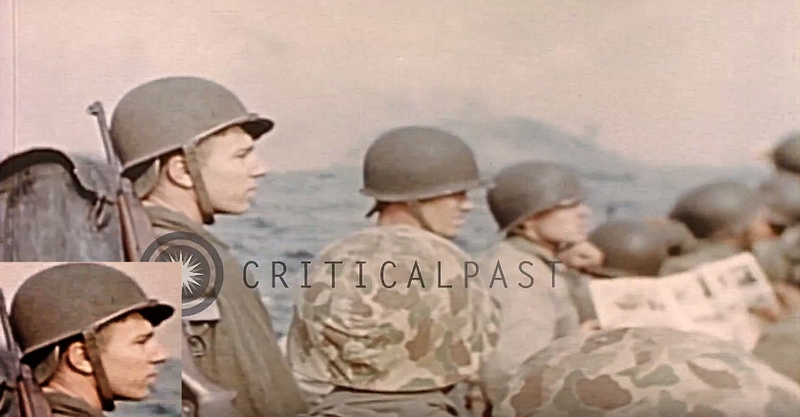 It appears that the entire video (see below), from which the previous footage is taken, was shot from inside the Higgins boat that Robert Lehmkuhl was in on the way to the shores of Iwo Jima. 2) Page 234 of The First Battalion of the 28th Marines on Iwo Jima: A Day-by-Day History from Personal Accounts and Official Reports, with Complete Muster Rolls. The soldier with the M1 Carbine and water proofed pack, which is most likely carrying communications gear, may be Corporal Robert L. Lehmkuhl. See the next video clip below for what appears to be “Lehmkuhl” written on the bill of the soldier’s cap which is under his helmet. See screenshot of soldier’s profile from this footage below. “Lehmkuhl” on the bill of the soldiers cap? 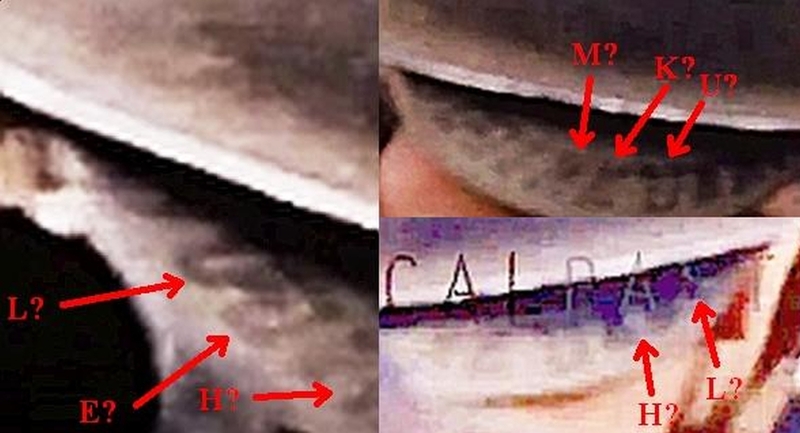 After very close examination using an imaging application to vary contrast, gamma, saturation and sharpness, the writing on the bill of the soldier’s cap does seem to be “Lehmkuhl”. Note: It is extremely difficult to make out exact letters due to the video quality. For instance, the “K” can look like an “E” depending on the scene. 1) Of all of the soldier’s in the 5th Marine Division during WWII, only the names Lehmkuhl and Shimkus contain “MKU”. The name on the cap does not look like Shimkus. 2) If the writing is actually “MEU” rather than “MKU”, only one name contains these letters – Meugmot. Again, the writing does not look like Meugmot. These are a collection of screenshots from portions of the previous footage.